We first learned about Bot Tots when we were looking for unique, organic baby clothing and we found the adorable Lily O’Geary onesie. As we learned more about the mission of the company and the quality of the products we knew we had found something unique and worth sharing. Bot Tots was founded by Erin Saelens with the “vision of brightening children’s wardrobes around the World.” As an environmentally and socially conscious company Bot Tots clothing is 100% organic, their books are printed 100% recycled paper and they donate 5% of all proceeds to In My Shoes, INC., an organization that provides mentors and social events to foster youth. The Bot Tot clothing line ranges from infant onesies to size 4. Every item is bright and cheerful with large graphics of each of the Bot Tots characters. Each character is brought to life in the book Cog Corner Goes Green. I couldn’t have agreed more. So we decided that each time we go to the park we would take some Tinker Trash Bags to pick up the garbage and recycling to take home. It’s hard to believe that the local park doesn’t even have a trash can or recycling bin but it doesn’t, so it’s up to the residents to keep it safe and clean for the neighborhood children. This book helps reinforce the responsibility we all have to take care of our neighborhoods. 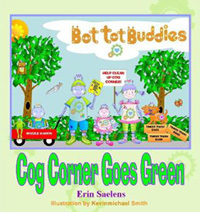 Cog Corner Goes Green can be read with children of all ages and each age may take a different message from it but it’s a perfect way to help teach your children that their choices can make a difference. It also teaches them about hard work (it took five days to clean Cog Corner) and team work which are values that will benefit them throughout life. 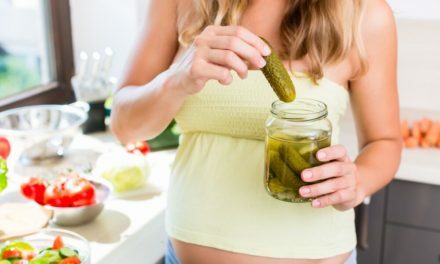 As much as the task of cleaning up the environment is overwhelming, it’s reassuring as parents to know that there is momentum and excitement around improving the world and making it a healthier planet for our children. Including books like Cog Corner Goes Green in your children’s library along with being a role model of a greener lifestyle, we can affect change, inspire our children to take pride in their neighborhood and have a positive impact on the earth.